Although asteroids and comets seem like two distinct populations at first glance, it turns out that there is a huge amount of variability in the “small solar system body” spectrum. Several classification schemes exist to differentiate the two: the existence of a transient, unbound atmosphere; ice content and formation location; the Tisserand dynamical parameter T, which measures close-approach speed to Jupiter. Although they are independent, these three criteria surprisingly tend to classify objects in the same way. Orbitally-classified asteroids tend to exhibit asteroid-like physical properties, and the same goes for comets. 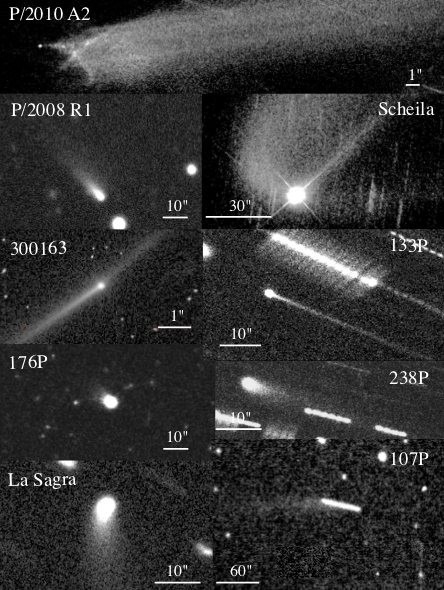 There are exceptions, however, and this paper focuses on one subset: small bodies which are dynamically similar to asteroids, but which lose mass like comets. The author first reviews observations of these so-called “active asteroids,” and then summarizes possible mass loss mechanisms which could account for their appearance. Figure 1 shows how morphology (coma or no coma) and the Tisserand parameter can be used to classify these objects. This paper focuses on the upper right corner. 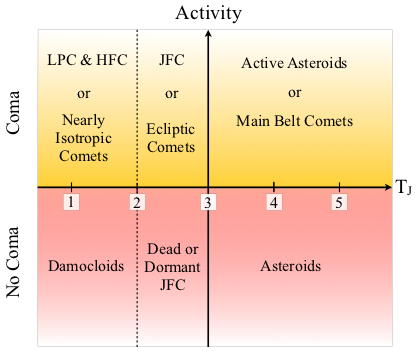 Figure 1: Classifying comets and asteroids by morphology and Tisserand parameter. LPC = long-period comet, HFC = Halley family comet, JFC = Jupiter family comet. Of the known eleven mass-shedding asteroids, nine are spatially resolved and shown in Figure 2. Their Tisserand parameters range from 3.083 to 4.508, placing all of them above the T=3 asteroid criterion. Figure 2: Nine spatially-resolved active asteroids. Although they are dynamically similar to asteroids, note their comet-like appearance. Sublimation: the paper considers sublimation from an exposed crystalline ice surface in thermal equilibrium with sunlight. While exposed ice sublimates quickly, ice protected from direct illumination can survive indefinitely. The main result is that if the ice is dirty (low albedo), exposed water ice will sublimate in asteroids located over the entire range of the main belt. Impact Ejection: since collisions between asteroids occur at speeds of several km/s, the ratios of the ejecta mass to the projectile mass are often large and thus these collisions are highly corrosive. The paper derives a relation between the asteroid and projectile radius and the consequent brightening of the object. Rotational Instability: given the distribution of asteroid rotation rates, it is possible that rotational breakup could cause mass loss. Since spin-up times vary inversely with radius, the smallest objects are most likely to experience rotational bursting. Electrostatic Forces: on the “day side” of an asteroid, the ejection of electrons due to the photoelectric effect from solar UV and X-ray photons creates a positive charge on the surface. On the dark side, the larger flux of solar wind electrons leads to a negative potential. These forces can move dust particles and possibly accelerate them past the escape velocity, leading to mass loss from an asteroid. Thermal Fracture: if the stress from the temperature change on an asteroid exceeds its tensile strength, fractured material with speeds greater than the gravitational escape speed may be ejected from asteroids with radii up to 20 km. This mechanism would only work on objects close to the Sun. Thermal Dehydration: hydrated minerals in outer-belt asteroids can contain 10-20% water by weight. If liberated, the gas flow could carry away small particles, leading to mass loss. However, the activation energies needed to liberate water is in general much higher than the thermal energy experienced in the asteroid belt. Shock Dehydration: the dehydration process mentioned above could also be caused by shock pressure waves in impacts. Although feasible, this mechanism is at best of secondary importance. It also introduces the possibility of mistaking this event as sublimating ice. Radiation Pressure Sweeping: dust particles close to the surface of the asteroid could be driven away by radiation pressure. If the contact forces holding the dust to the surface could be overcome, this mechanism could be significant for asteroids 10 km in size and lower. The paper concludes by proposing specific mechanisms for individual objects. Unfortunately, there is no one prevalent mass loss mechanism among the nine analyzed! A new population of comets? An Improved Model for That Pesky Zodiacal Dust Most Asteroids are Not in the Asteroid Belt Chondrule formation by shocks?